People don’t often think of Maryland as being south of Washington, D.C., but there are plenty of communities down there, on the east bank of the Potomac. La Plata, for instance, is a thriving town located just outside the extensive Washington Metro Area, and its residences include an eclectic mix of stately old Colonial and Post-Colonial homes sitting down the street from brand new townhomes and single residences. And while the older houses are more likely to have to deal with foundation cracks and crumbling, eventually every building will have to worry about foundation repair in La Plata. Older buildings, especially those that are around 50 years old or more, often have problems when it comes to their foundation, assuming one of its owners hasn’t replaced it already. Concrete tends to have a limited lifespan, since the cement, the powdered mineral that acts like glue, will slowly dissolve away over time. However, there are so many variables that go into how quickly concrete ages, so that 50-year figure is a ballpark estimate at best. Too much exposure to water can really accelerate the decaying process, and the exact mix used to make the concrete can have a big impact. Modern foundations, for instance, will likely last much longer overall than ones poured over 100 years ago. Fortunately, there are a few warning signs you can look for that will tell you whether a concrete block is too far gone to repair. For instance, if you tap concrete with a hammer, it should produce a dull thud, and if it produces a hollow ring instead it means that the concrete is decaying away from the inside. In other cases, the decay may be perfectly obvious: if the concrete produces a white powder, if the steel reinforcing bars are exposed or staining the concrete rust red, or if the stone comes away in chunks without you having to smash it to pieces, the concrete is decaying. Still, it’s not always obvious when concrete is too far gone, so it’s a good idea to consult with an expert before you make any final decisions. Even if your building’s foundation was laid before 50 years ago, that doesn’t mean you’ll be free of any problems for the first five decades. Water can make its way into the concrete and start creating cracks thanks to the way it expands and contracts with the weather, a tree planted too close to the building could start cracking the foundation or the basement walls as its roots put pressure on the stone, or the earth itself could move and put a lot of pressure on one side of the foundation. Fortunately, there are easier ways to pull off a foundation repair in La Plata than to put the house on blocks and replace the whole thing. Smaller cracks you can repair with a little concrete or epoxy, although if there’s water seeping in you’ll need to address that separately. 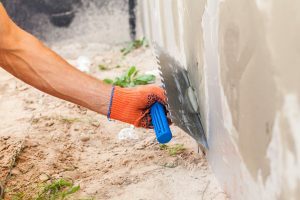 Larger cracks may require more serious surgery, and other issues like bowing basement walls and a settling foundation demand different fixes depending on what the problem is and how serious it is. Depending on how handy you are at home improvement, you may be able to perform some foundation repair in La Plata or whichever community you live in. However, for some jobs it pays to bring in the experts, and that’s where AA Action Waterproofing comes in. We’ve worked on basements, crawlspaces, and foundations throughout Maryland and our neighboring states ever since 1987, and in all that time we’ve never met a problem we couldn’t make right. When it comes to foundation repair, in La Plata and elsewhere, we can let you know whether a crack is superficial, whether it’s something to worry about, and what you’ll need to do to make things stable again. We also offer our services as consultants for new construction and for inspecting a property you may want to buy. You can contact us online or call our number today to set up a free, no-obligation initial estimate, so if you live in our area, don’t be afraid to ask us about your foundation problem.